I had the privilege of officiating at the August 3 wedding of David and Leah Gaeddert. 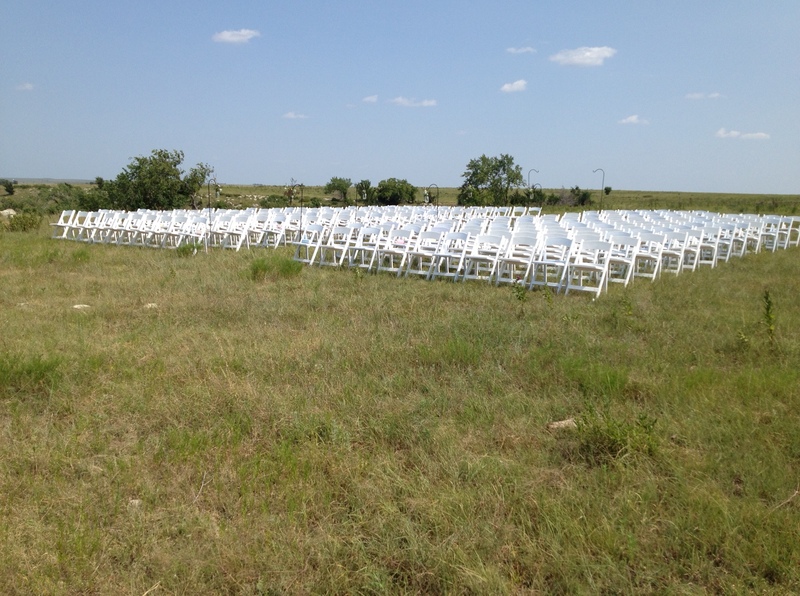 The wedding was held in the Flint Hills near Elmdale, KS. There we were in the GREAT company of grasshoppers, bumblebees, prairie grasses, limestone, and mosquitoes. There we were under the open sky, gazing out into the open horizon. (It must have been in the Flint Hills where someone came up with the KS motto: As big as you think.) And there we were, an amazing assortment of people, from a variety of places, ready to offer support. While I’ve attended many outdoor weddings, I’ve never officiated at one. This means I had to think through what bug spray to wear, what dress to wear that wouldn’t blow every which way, and how to assemble my notes in such a way that they would be protected from sudden gusts of wind. And yes, I had to be prepared for what I thought would be THE WORST scenario: A bumblebee would land on me and make this pastor go screaming and running for (away from?) the hills. Thankfully that didn’t happen. I received permission from David and Leah to post my wedding reflection. As you’ll notice, I am no stranger to the Flint Hills. In fact, I keep hoping to offer a Flint Hills hike some Sunday afternoon for those interested at Rainbow. It would be about a two hour drive, but look where we would end up! Stay tuned for details. David and Leah, here we are your wedding day, a day that you have looked forward to for some time now. Here we are surrounded by some of your closest friends and family. Here we are in the glorious Flint Hills of KS, a place that is infused with natural beauty: open sky, open land, unending horizon,…. And here we are to give thanks to God, the source of all love. I don’t know if I ever told you this but I have spent a lot of time in these hills. A couple times a month our family would drive 15 miles east of Marion for walks and horse rides. And so as I prepared for this day I thought about what what this place, what these hills might have to teach us about God, relationships, and love. During hikes in these hills and in order to keep up with my parents, I would often have to look down just to make sure I didn’t fall. And so from an early age I began to notice all of the delicate beautiful flowers and grasses, this understated beauty that you can only see close-up. As I got older I learned that prairie grasses, such as the great Bluestem, have an amazing underground web of roots. These roots sometimes reach 10 feet into the earth. It is this hardy system of roots that allow these grasses to survive in the harshest of conditions, especially drought. The prairie grasses are tougher than most of us realize. They persist year after year after year because of their hardy root system. And so what might this place, what might the Bluestem teach us? I singled out the Bluestem because I think the two of you are keen observers. You seem to value beauty that isn’t just flashy, but beauty that has more substance. You have an appreciation for what is going on beneath the surface. Another reason I thought of prairie grasses is that my prayer for you is that you too will keep developing a hardy, sustainable, nourishing root system as individuals and as a married couple. I pray that you too will be able to withstand the droughts: the disappointments, the failures, the heartaches. I pray that you too will have roots that will help you weather the extreme conditions of life; roots that will help you grow in healthy ways; roots that will be life-giving providing you the necessary nutrients all year round, so that your relationship will also persist year after year after year. Fortunately you both have had many people who have nourished your root system. You both have been nurtured in healthy soil with lots of nutrients. Many people have made it possible for you to be standing here today. Many people have taught you about what it means to grow and mature. Now as a married couple you will begin to tend these roots in your own, creative way. You will find ways to nurture these roots making sure they get the necessary nutrients. You will find a way to surround yourself with friends and community and hopefully these friends or this community will help you to not only tend to the material or obvious things of life, but will help you see what might be below the surface, beyond what we can immediately see or know. Over the centuries and generations, people have looked in part to Scripture as they develop this hardy root system. This of course is not the only source for developing roots that will last, but it is an important, life-giving dimension for many. And so in closing, I would like to share a passage from from a letter to the Ephesians. I think whoever wrote this must have had plant life around him or her. 1 Response to These hills are alive! These are beautiful words–ones that will surely encourage the young couple through their marriage.